A composite image showing regions of Mercury permanently in shadow highlighted in red, hydrogen-rich regions highlighted in yellow. THERE IS WATER ON MERCURY, DUDE. Well, ice, that is. 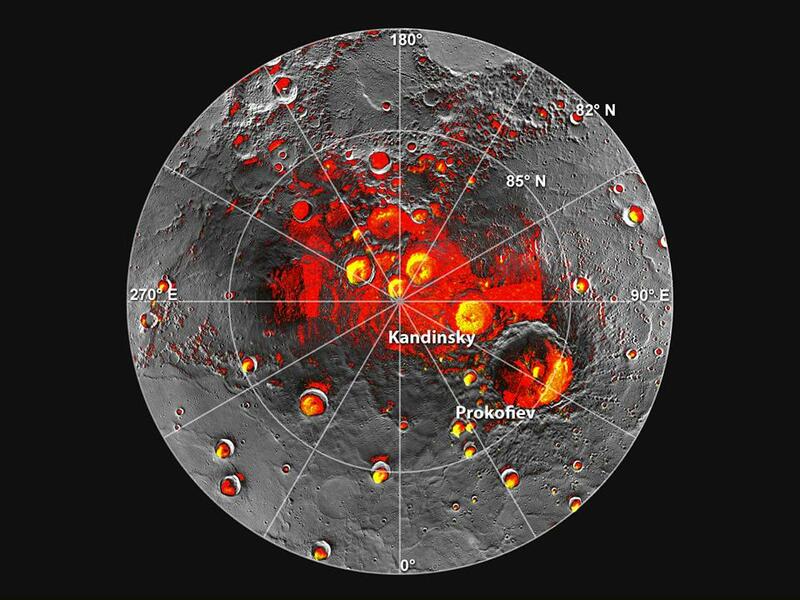 For over twenty years, scientists have accepted the working hypothesis that water or ice may exist on Mercury based on bright patches that showed up in reflected in radar images of Mercury’s north pole. But with temperatures reaching as high as 800 degrees Fahrenheit on the sunny side, without definitive proof that the conditions for ice to thrive existed on Mercury, the hypothesis could only remain such. Through experiments using infrared imaging, combined with satellite imagery, altitudinal data, and temperature modeling, NASA scientists are confident the hypothesis that water ice exists on Mercury is true. But all this pales in comparison to the discovery that regions of the water ice deposits on Mercury are covered with dark patches of less reflective material – presumably material deposited by asteroids and comets that impacted the Mercurian surface. Mercury is approximately the size of Earth’s moon. Because Mercury is so small, it lacks the gravitational forces necessary to retain a substantive atmosphere. The solar winds Mercury experiences are so strong that nearly all of Mercury’s atmosphere was blown away long, long ago. As Mercury has almost no atmosphere, asteroids don’t experience the atmospheric burn that asteroids entering Earth’s atmosphere experience. Because asteroids experience no burn approaching Mercury, material on or within an asteroid can be retained upon impact with Mercury. So, if an asteroid that hit Mercury’s north pole contained organic material, it is likely that organic material is retained in deep freeze on Mercury’s poles. Considering all of this, if this dark material on Mercury is organic, where did it come from? Organic material. Alien organic material. © 2016 NuclearGrrl. All rights reserved. Nuclear Grrl – Atomic Feminist Blog at WordPress.com.